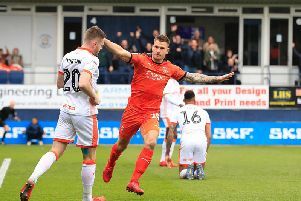 Luton boss Mick Harford felt that referee Lee Collins should have given striker James Collins a talking to rather than send off his top scorer in the 2-2 draw with Blackpool this afternoon. With the scores 1-1 and an hour gone, Collins was booked twice in the space of two minutes, the first for kicking the ball away, the second for a lunging challenge when he had lost possession. The Tangerines then scored immediately after the decision from a corner, sub Jason Cummings rescuing a point late on. Harford had no issues with the first caution, but felt some leniency could have been shown for the second. He said: "It was a stupid first booking, the second booking we were right near it and it was a tackle, he’s caught the lad on the bottom of his boot. "There was nothing malicious in the challenge, the referee should have just called him in and had a chat with him, but they don’t do that these days. "They’re happy to get cards out and send people off, it had a massive bearing on the game obviously, losing your top goalscorer. “He’ll miss the Charlton game and he'll be more disappointed than anyone as he just wants to play football and play games for this football club. "It was stupid what he did, but there was a bit of frustration and I can understand why he's frustrated as some of the refereeing decisions were a bit peculiar in my opinion."